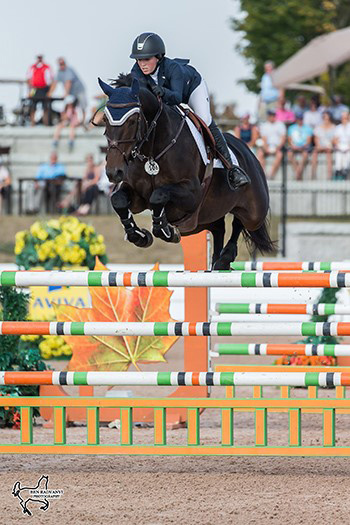 Ali Ramsay of Victoria, BC, won the $86,000 Grand Prix and claimed the coveted Caledon Cup on Sunday, September 24, at the CSI2* Canadian Show Jumping Tournament at the Caledon Equestrian Park in Caledon, ON. Site of equestrian events for the 2015 Pan American Games, the Caledon Equestrian Park was hosting its fourth and final week of International Equestrian Federation (FEI) sanctioned competition for the 2017 season. A total of 30 competitors took on the challenge set by course designer Oscar Soberon of Mexico and when 13 pairs successfully negotiated the first-round track, the heat was on for the jump-off. Ten-time Canadian Olympian Ian Millar, 70, of Perth, ON, was the first rider to post a clear round in the jump-off, guiding Vittorio 8, a nine-year-old Hanoverian gelding (Valentino DDH x Ramiro’s Bube) owned by Future Adventures, home in a conservative time of 45.76 seconds. Erynn Ballard, 37, of Tottenham, ON, quickly improved on Millar’s time, stopping the clock in 45.31 to move into the lead with Royale du Rouet, a 12-year-old selle francais stallion (Nouveaute du Rouet x Kannan) owned by Jake Krembil. Her time would be eclipsed by the next rider in the ring, 38-year-old Isabelle Lapierre of Breakeyville, QC, who had the crowd cheering as she raced through the finish line in a time of 41.47, shaving almost four seconds off Ballard’s time to overtake top spot. Lapierre’s partner was the game ten-year-old Dutch Warmblood mare (Diamant de Semilly x Calando IV) owned by Ecuries de la Chaudiere. The lead changed hands yet again when Ramsay made a daring move on course, cutting inside to a liverpool with Hermelien VD Hooghoeve, her ten-year-old Belgian Warmblood mare, instead of taking the right-hand roll-back. The move paid off, as the scoreboard reflected the new leading time of 40.76 seconds. Five more riders would attempt to catch Ramsay’s time, although none dared to try her inside turn. Amy Millar, 40, of Perth, ON, was the only rider to break the 40-second barrier, but a rail down with her 2016 Rio Olympic mount, Heros, left the pair in fifth place with a time of 38.04 seconds. Ramsay claimed the first Grand Prix victory of her career, followed by Lapierre, Ballard, and Ian and Amy Millar making up the top five. Surprisingly, the daring move that earned her the win was not part of her original jump-off strategy. In fact, her double-clear effort for a fourth-place finish in Friday night’s $35,000 CSI2* Caledon Cup – Phase Two, combined with her victory in the $86,000 CSI2* Grand Prix, which acted as Phase Three of the Caledon Cup, gave Ramsay a total of 33 points in the Caledon Cup standings over Ian Millar who earned 32 points paired with Dixson. In addition to claiming the victory, Ramsay also won the $1,000 Henry Equestrian Plan (HEP) Rider Bonus, presented to the highest-placed competitor sporting the HEP saddle pad presented to all FEI competitors during the FEI horse inspection. In another special presentation held prior to the start of the $86,000 CSI2* Grand Prix, Alexanne Thibault of Boucherville, QC, was recognized as the recipient of the McKee-Pownall FEI Groom Appreciation Award. Selected during the FEI horse inspection, Thibault, who competed in all three phases of the Caledon Cup riding Chacco Prime, has the unique distinction of being her own groom. Craig Collins of Equestrian Management Group (EMG) spoke to the success of this year’s CSI2* Canadian Show Jumping Tournament, saying, “It was a great week with great turn-out, and a great field of competitors with lots of good horses and riders. We had a huge crowd on Friday night in the indoor arena and when the times kept getting faster and faster in the jump-off, the crowd was going crazy! It was a lot of fun. And although it was a hot week we are fortunate that, due to the legacy of hosting the Pan American Games, we were able to provide misting fans and other amenities to take top-care of the horses. For more information on the Caledon Equestrian Park, including full competition results from the 2017 season, please visit www.caledonequestrianpark.com.